Stallions - Maverick Hill Dressage LLC. The Stallions shown on this page offer excellence in all performance and conformation venues. Durango is an ACPS approved stallion. He is the only standing stallion by Aladdin's Denver by Aladdin. 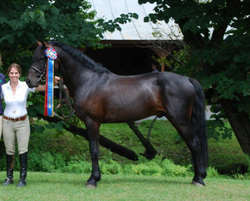 In 2009 Durango took the Region One Champion Stallion title out of 7 standing stallions in New England. He returnes to capture the ACPS 2012 region 1 High Point Proformace Stallion award. With 9 foals on the ground, he has proven to be a prepotent stallion. All of his offspring possess exceptional personality with athletic ability. Durango is an outstanding jumper wtih cat like agility and scope. On the flat he shows stunning freedom of shoulder and sound mind for the dressage arena. Producer of performance, designed for perfection.